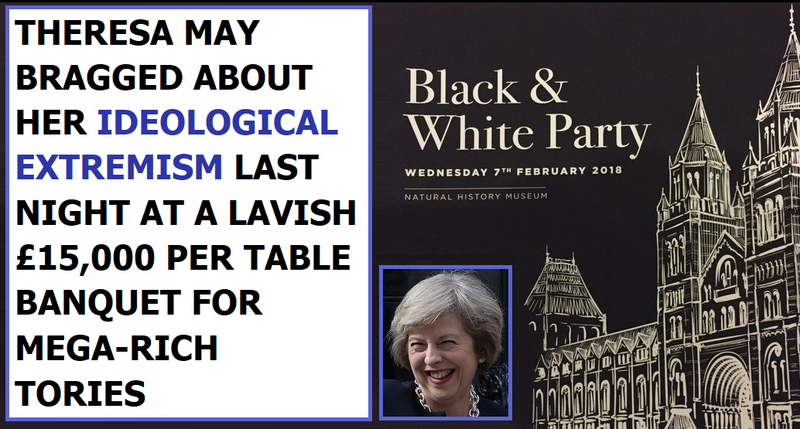 On the evening of Wednesday February 7th 2018 the Tory party held a lavish black tie banquet for their mega-rich donors. 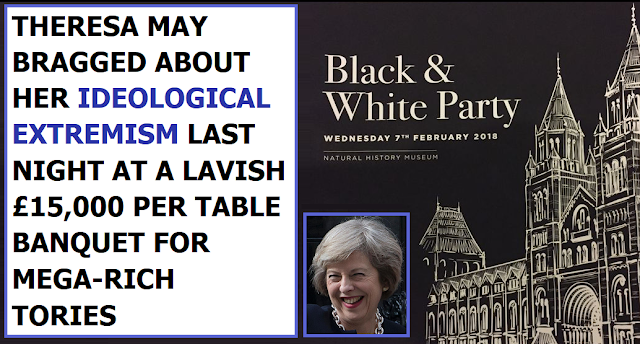 The hard-right elitists who bankroll the Tory party gladly paid up to £15,000 per table for a chance to rub shoulders with Tory politicians like Theresa May, Boris Johnson, Michael Gove, and Esther McVey. The banquet was followed by an auction in which people literally paid for access to top Tory politicians. Beneficiaries of this "cash for access" auction paid £55,000 to spend a day with Theresa May, £30,000 for dinner with the Defence Secretary Gavin Williamson, and £12,000 for dinner with Michael Gove and his wife. If splurging such extravagant mountains of cash on such trivialities in order to bolster Tory party coffers wasn't sick enough, Theresa May's speech to her inner circle of Tory politicians and mega-rich donors absolutely took the biscuit. After crudely smearing Jeremy Corbyn as a populist for ... err ... daring to have policies that are popular with the general public, she then bragged about her own ideological extremism by explaining that she's "on a mission ... to defeat socialism". People who can afford to splurge £15,000 on an evening can obviously afford their own private health care, so this kind of ideologically driven smash socialism rhetoric went down a treat with Theresa May's mega-rich donors, but to anyone in Britain with a grain of sense Theresa May was spewing dangerous hard-right rhetoric, because destroying socialism means destroying the NHS. 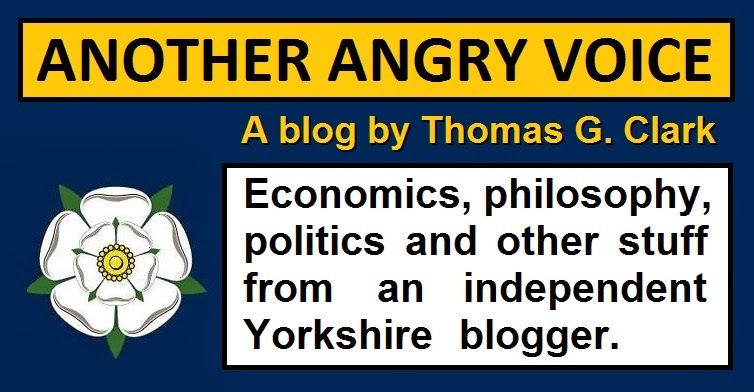 The vast majority of people in Britain are democratic socialists who want to see a balance between public and private ownership, and who value their hard-won workers' rights to stuff like paid holidays, parental leave, sick pay, and the right to take bad bosses to employment tribunals. The statistics provide ample evidence that this is the case. 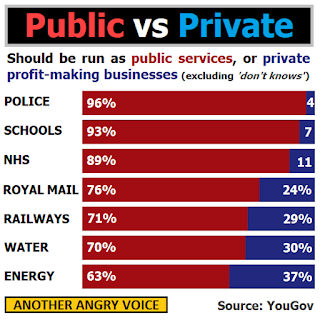 Ask people if they want the NHS, schools, or police force privatised and the overwhelming majority will say no. Ask people if they want the supermarkets, airlines, or newspapers nationalised and the majority will say no thanks to that too. 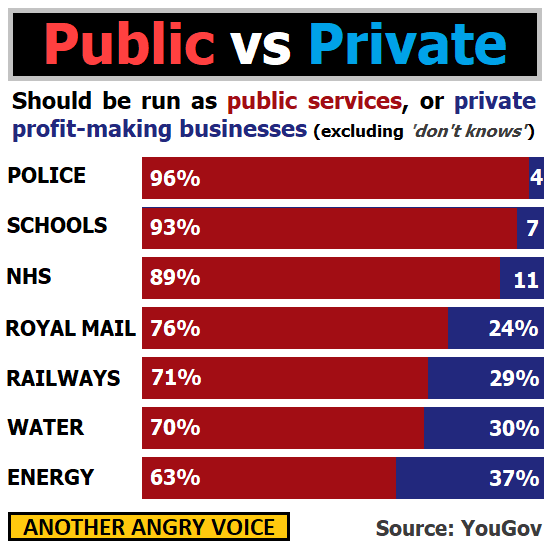 Most Brits want a mixed economy with a balance between publicly owned infrastructure and services (socialism), and a properly regulated market economy (capitalism). But when Theresa May is promising her mega-rich donors that she's going to "defeat socialism" there's no nuance, and absolutely no room for the middle ground. What she's bragging about is her fierce ideological determination to wreck social ownership structures and trash workers rights. Look at May's point-blank refusal to rule out opening the NHS up to be asset stripped by massive US health corporations when she brazenly evaded a simple yes/no question at Prime Ministers Questions earlier that day. Look at the way Theresa May whipped her MPs into voting down a Labour Party amendment to her EU Withdrawal Bill that aimed to prevent Tory ministers from using Brexit as a Trojan Horse to scrap our workers' rights. How is it possible to see either of these things as coincidental when she's openly bragged to a room full of millionaires and billionaires about how she's on a mission to eradicate socialist public ownership structures, and the workers' rights that have been won for us by generations of socialists? The sad thing is that swathes of the public are so easily manipulated that they actually believe that Jeremy Corbyn is some kind of radical hard-left extremist just because right-wing hacks in the mainstream media keep telling them that he is, even though he wants a centre-left balance between socialism and capitalism. Yet when Theresa May openly brags to a room full of millionaires and billionaires about her fanatical desire to eradicate socialism (which includes the NHS, publicly owned roads, universal education, the social safety net, legal aid, workers' rights ...) hardly anyone in the mainstream press even bats an eyelid!